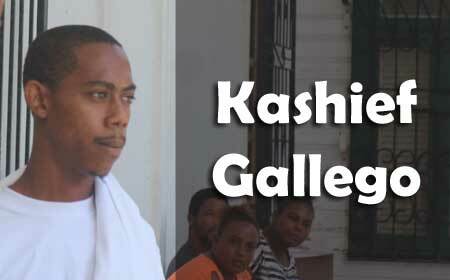 BELIZE CITY, Fri. June 23, 2017–The man who allegedly pumped three bullets into the back of Jermaine Franklin, 36, last Wednesday evening at a video store on King Street, hid his face from court reporters’ cameras as he was led from the court’s holding cell to the courtroom of Senior Magistrate Sharon Fraser to be arraigned on the murder charge. After reading the charge, Magistrate Fraser asked Gallego if he understood what she had just read to him. Gallego, an unemployed resident of East Collet Canal Street, replied that he understood. Magistrate Fraser then began explaining to Gallego the rules surrounding the charge of murder. “This matter is indictable. What that means, it will not be tried in this court. All that is required of me is that I read that charge to you and make sure that you understand it,” the Senior Magistrate told Gallego. She told him that within the next six months, he will be provided with disclosure of the evidence the police have against him, and after he get his disclosure, a preliminary inquiry will be held. Gallego asked how long would he be remanded. The courtroom fell silent for a short while as the magistrate read the brief police facts that were attached to the court book. After reading the brief facts, Magistrate Fraser told Gallego that he came to the attention of the police through video surveillance footage. The police got a copy of the video. Continuing with the facts from the court book, Magistrate Fraser explained to Gallego that police got a call in their control room about shots being fired on King Street, and when they arrived there, they found the lifeless body of Franklin with three bullet holes in the upper back. “A red-skinned man who was wearing a blue T-shirt and black ¾ pants walked into the store and fired three shots in his direction. Several persons in the area were interviewed and statements were given to the police. A caution statement was taken from you by Assistant Superintendent Cowo. This is preliminarily what they have,” Magistrate Fraser said. “Based on that, I no see what lawyer could come here and tell me that I am not to commit your matter. All I need is prima facie evidence to commit you to the Supreme Court,” Magistrate Fraser told Gallego. She added that some people were on remand for murder for 5 years. Gallego is scheduled to return to court on August 23. Around 6:00 p.m. on Wednesday, June 21, Jermaine Franklin wanted to watch a movie at his Fabers Road Extension home, so he went to buy the movie from Teddy’s Music, located on King Street. Franklin bought Terminator 3 — Judgment Day, but ran outside the store after an assailant walked into the store and pumped 3 shots into his back. Franklin collapsed on the street outside and died.